The Lexus LFA on display at the Detroit auto show in 2010. TOKYO -- Long live the Lexus supercar. Toyota Motor Corp.'s Lexus, which ended a two-year production run of the $375,000 LFA in 2012 after manufacturing 500 units, will build a successor to the 552-horsepower car, Executive Vice President Mark Templin told reporters today. The plan has the endorsement of Toyota President Akio Toyoda, he said, without providing specifics. "Akio believes that every generation deserves to have a car like an LFA, so we're building an LFA for the generation we have today," Templin said in Kyushu, Japan, before a ceremony for the new Lexus NX crossover. "At some point, there may be another special car for another generation." 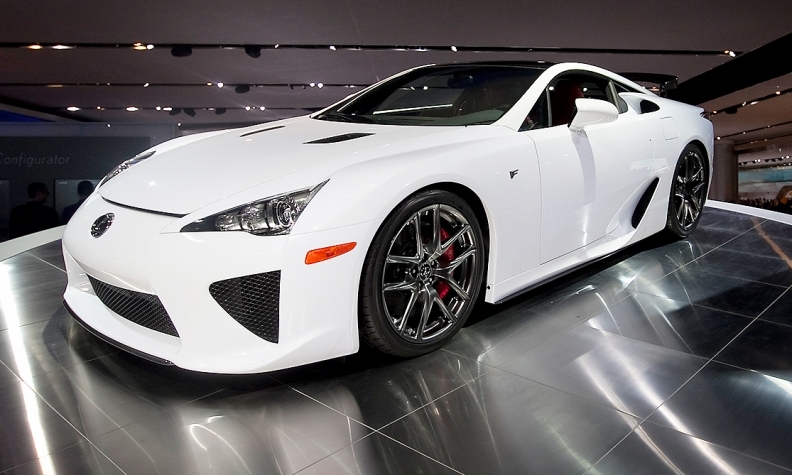 The LFA was a decade-long project that Templin said motivated Lexus engineers, improved the brand's reputation and influenced work on premium models the company has introduced since. It also gave the world's largest automaker a model to compete with brands including Volkswagen AG's Porsche, Fiat S.p.A.'s Ferrari and Daimler AG's Mercedes-Benz. Lexus has turned the U.S. luxury car market back into a three-brand race this year after years of Toyoda pushing the company's premium division to expand its reputation beyond quality and add styling and performance attributes. Redesigned versions of the IS sedan and GX SUV have helped narrow the lead of Mercedes-Benz and BMW AG's BMW in the U.S. market this year. Toyoda, 58, named a designer to lead the brand for the first time by promoting Tokuo Fukuichi earlier this year. The company introduced its first turbocharged engine to a Lexus model with the NX, which started selling in Japan last week, and the RC and RC F sport coupes arrive in U.S. dealerships by November. Lexus is targeting 550,000 deliveries worldwide this year, up from last year's record 523,000 units. About half of the brand's worldwide sales in 2013 were in the United States, where deliveries rose 12 percent to 273,847 vehicles. Sales in the United States are exceeding Toyota's target and on track to surpass 300,000 units this year, Jeff Bracken, the brand's general manager for the market, said on an Aug. 1 conference call. Deliveries of the brand's second-best selling passenger car IS have almost doubled, while sales of the GX SUV have more than doubled. The NX crossover is selling in Japan starting at 4.28 million yen ($42,000), according to a July 29 statement. The company plans to sell 700 units per month in its home market.